The ES-SloMo J is a fully featured slow-motion controller for Sports Television, Training and Quality Assurance applications. 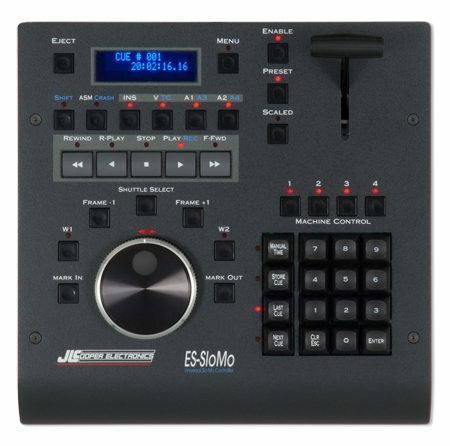 Based on the Edit Suite 450 series of VTR/DDR controllers, but capable of controlling up to four machines, the ES-SloMo J is equipped with a speed control T-bar, a keypad for creating and identifying up to 500 cues and a range of SloMo and QA configurations. 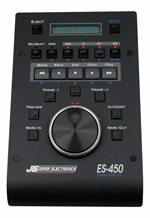 Hence, whatever the application, the ES-SloMo J is perfectly equipped to manage the slow-motion replay control of any tape or disk based video recorder. The speed control T-bar can be programmed to cover a number of different speed ranges – narrow or wide, forward and reverse, allowing the selection of the range most appropriate for any application. The cue functionality allows the creation of up to 1000 cues, which also include an associated replay speed. Cues can be replayed instantly or prepared for replay when required by the Play key. Cues can be paired to create Clips, each with a start and stop time. 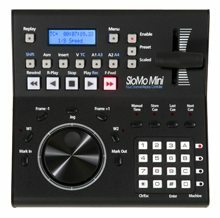 SloMo replays blocks of cues in sequence to create simple presentations or programs. The ES-SloMo J features the JLCooper precision weighted jog wheel and concentric shuttle ring. For QA facilities, the fourth control port can be reconfigured to output logged fault or error timecode locations with an associated tag to identify the type of fault. The ES-SloMo is particularly suited to interfacing with multi-channel video servers; for example a control port can be disabled to protect the record channel once it is acquiring material, while the remaining control channels handle the slow-motion and cue replay. Available in Ethernet, RS-422 and USB versions.